​Step back in time to view holiday decorations from yesteryear while also appreciating the comforts of the present day holiday season. This authentic, turn-of-the-century Queen Anne Victorian is recognized on McMinnville's Register of Historic Homes. The owners have restored the Grand Dame to her original 1896 glory, and recently repurposed the triplex into a vacation inn. Fresh greenery, frosted glass ornaments, and lighting reminiscent of turn-of-the-century decor transform the inn into a vintage Victorian holiday scene. 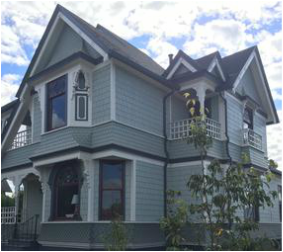 While visiting the "Victorian on 10th", make sure to notice the quaint mailbox out front, the elaborately carved bannister, and pocket doors in the entry, the tin ceilings, the ornate door hardware and the elegant stained glass windows. Learn more about this home.